Canon Inc., Fukihara Bldg, 9-9 Ginza 5-chome, Chuo-ku, Tokyo, Japan. 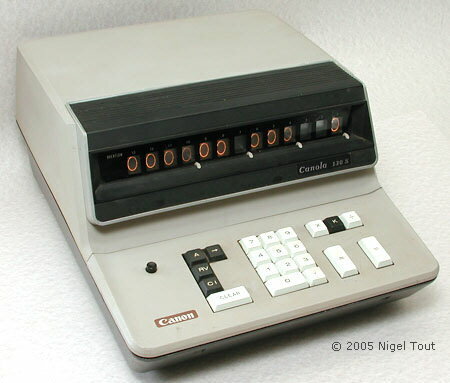 Canon produced desktop electronic calculators in the late 1960s and early 1970s under the Canola tag. Using Texas Instruments integrated circuits and experience gained from TI's "Caltech" project of 1966 in the design of a hand-held calculator, Canon introduced one of the first hand-held calculators, the Canon Pocketronic in 1971. This was followed by a series of models in its "Palmtronic" range. Four-function machine dating from about 1968, developed from the first Canon calculator, the Canola 130 of 1964. It uses discrete transistors and employs the unusual "light-pipe" display modules (three of which are not working in the example pictured). This was one of the first hand-held calculators, introduced in late 1970/early 1971 and is based on the "Caltech" developed by Texas Instruments. All calculations are printed out onto thermal paper tape. One of the many Canon Palmtronic models, this one, with a battery-level meter, is shown plugged into its charging unit. It dates from about 1972. For further photographs of Canon calculators see the Calculator Photo Library on this site.